You know I really don’t dig burgers. Certainly not from places you can actually drive through. Shudder. In fact, I have never had so much as a nibble of a big mac. Not even the frshly cooked fish and chip shop variety. In fact, not even a homemade version of the same. But I do love messing with the burger concept and often find a variation I do enjoy. In fact I found another one tonight. 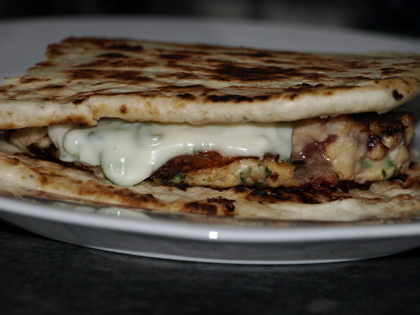 Naan Seafood Burger with Coriander Mayonnaise. Mix coriander and mayonnaise together. Place marinara, egg and flour in thermomix. Blend for 10 seconds on speed 8. Remove. Heat a couple of tablespoons of oil in large frypan and spoon large chunks of seafood mixture into pan. Shape into burger shape with wooden spoon and fry on either side until golden and cooked through. Remove and keep warm. Lightly brown naan in pan. Cut each naan in half. 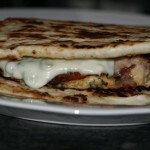 Use one half as bottom burger bun, Top with burger and mayonnaise and top with other half of naan. Repeat until you have 6 burgers.